[UPDATED] The contest is over – thanks to everyone who listened to the PodCentennial show and entered! 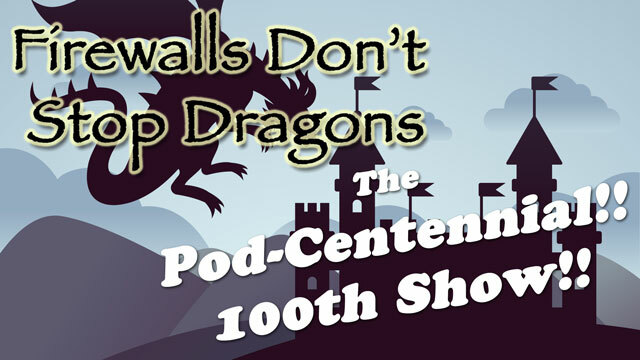 The 100th episode of my Firewalls Don’t Stop Dragons podcast will air on January 28th! It’s hard to believe I’ve been doing my show every week for almost two years now. It all started when I was asked to be a guest on a different cybersecurity show (George Orwell 2084) a couple times in late 2016 and early 2017. Shortly after this, the host of that show decided to pursue other things and asked me if I’d like to take over his show. I had never considered such a thing, but decided to give it a go. And the rest, as they say, is history! And I shall dub this show my Pod-Centennial (#PodCentennial)! But it turns out that there is another wonderful thing to celebrate… January 28th also just happens to be international Data Privacy Day – what a remarkable coincidence! I couldn’t have planned it better if I tried (and honestly I didn’t)! My guest for this show will be none other than Bruce Schneier! Bruce is a world-renowned cryptographer and cybersecurity guru. He’s written 14 books, including some that are on my very short list of highly recommended reading. Bruce has testified before Congress several times and is highly influential in the areas of computer security and privacy. I’ll be giving away lots of great stuff! Five lucky winners will get a signed copy of my book, a signed copy of Bruce’s latest book Click Here to Kill Everybody, and a selection of wonderful Apress books on cybersecurity! The show will focus on digital privacy and will be chock full of actionable tips that will help you reduce your data footprint online and avoid identity theft. Even if you’ve never listened to a podcast before, you really need to tune in to my Pod-Centennial! The interview with Bruce was entertaining and enligthening – plus you could win some really great books, including some personalized and signed! My show is dedicated to educating regular, everyday, non-technical people about the basics of cybersecurity. To me, it’s the digital equivalent of putting on sunscreen, wearing a seat belt and installing a smoke alarm. The tips I give are fairly simple and usually free (or close). I cover all the latest cyber news that matters to regular people and, when necessary, tell you what you need to do to protect yourself from the latest scam, hack or virus. Here’s the bottom line: The more people that do these simple things, the safer we all are. Like protecting against a communicable disease, if enough people are protected, we develop a herd immunity that protects even people who aren’t immune. So… it will actually help you (and everyone else) if you share this information with as many people as possible! Tell your friends and family to subscribe to the podcast (or read the book, subscribe to the newsletter, read the blog, or all of the above)! Shout it from the digital rooftop (ie, post it on social media)!